Good Friday morning folks and TGIF! !...my TV met says with this HIGH in the gulf,the weather we got yesterday might continue thru this weekend..rain etc beginning on our gulf coast then moving inland and east coast..and..with out Hot temps and very humid conditions..whatever storms do develop as they move inland could..get a bit stronger..all guesswork but..we see what one storm did when it reached Aug's area yesterday...just pay attention, be alert to any changing conditions and be safe ok....well have a great day everyone!..hmmm the blogs Coffee came out great this morning!! locally heavy rain will be the primary threats. over the interior and western sides of the east coast metro area. interior and Gulf Coast region next week. Weather Service forecast office in Miami. Yowza, Aug. Glad you're all right. So is the roof in-progress or complete? Not much here. 80 and humid mornings. 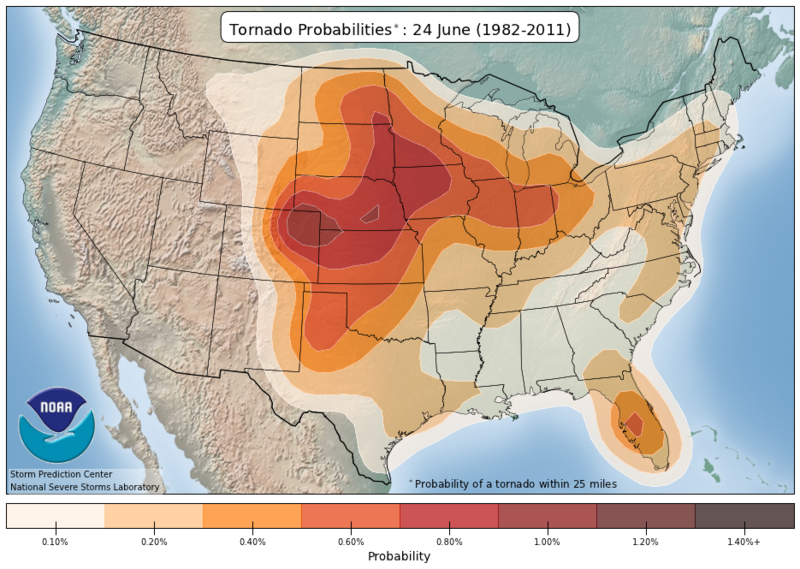 Chances of rain that don't materialize. Low 90's. Thanks for the coffee Largo! Yikes Aug! That sounds like some storm. Hope all is OK with the roof. Let's get some rain pretty please. BillsfaninSoFla wrote: Good morning everyone! That's what I do with bad weather and the tent fumigation schedule. When it was so stormy a year ago and fumigations were getting postponed jobs here and there,I called all my fumigations scheduled for the upcoming few weeks and suggested we be proactive and reschedule down the road to avoid a last minute postponement. Everyone opted to move their jobs voluntarily as opposed to taking a chance. My sub contractor had something like 70 jobs postponed in a two week period. What a mess! Oh my was it hot today! 97 and sunny. Then around 4 I heard thunder and the skies opened up and it absolutely poured for 30 minutes. 1.5 inches of rain .Perfect timing as hubby got lawn mowed earlier. So happy I was home and not driving in that. afternoon to early evening with an increase in coverage. county beaches through this evening. Good Saturday Morning folks! !..well we'll see how the scattered storms again today plays out and who gets lucky, not a drop at my house yesterday..but i know sooner or later lol.........gee Aug, sorry to hear that..did the company at least cover the part of the roof that may have been exposed?...and Billsfan, congrats on getting some rain yesterday, i know you too needed that rain....well im sipping the Blogs Coffee hmmm tastes great..grab a cup and get some hmmm...well have a great day folks!! Okeechobee and in the Atlantic waters including Biscayne Bay. Okeechobee this afternoon and evening. and Gulf Coast region Tuesday through Friday next week. and between 4 and 8 PM farther inland. at around 5 MPH, however storm motion will erratic at times. if skies look threatening, or you hear thunder. and south at less than 10 MPH most likely. flood stage, this weekend and into early next week. strikes, gusty winds and locally heavy rainfall. Good on you bills for being proactive and congrats on the rain! None here yesterday but after the deluge the day before I'm ok with a little drying out time. 6.7" for the month. Weekend looks dry and HOT. Heat indices tomorrow are forecast as high as 113. I don't have anything exposed Largo. The old shingles have pot marks/spider marks (whatever they're called). Over time (couple of years??) the asphalt would be eaten away leaving holes in the shingles. That's when water intrusion through the roof would become a concern. I guess I would sorta compare it to a pothole on the roadways. gee its soooo muggy and humid here,feels like mid August whew. My Imgur isn't cooperating but looking at the latest HRRR draw a line NE to SW from Daytona Beach to Lakeland then NNE to SSW from Lakeland to Port Charlotte. Points south and east of those lines have good rain chances. Points north and west look hosed for today. Get those chores done early Largo! I always like to be done by noon this time of year. It's warm enough as it is in the morning but better than the afternoon steam bath. StAugustineFL wrote: Get those chores done early Largo! I always like to be done by noon this time of year. It's warm enough as it is in the morning but better than the afternoon steam bath. Good afternoon. Just got a half-hour heavy downpour . An inch of rain. (And we were more on the fringe, points just south just got more) It was blowing so hard it looked like a Tropical Storm out there at times. BillsfaninSoFla wrote: Good afternoon. Just got a half-hour heavy downpour . An inch of rain. (And we were more on the fringe, points just south just got more) It was blowing so hard it looked like a Tropical Storm out there at times. congrats Billsfan, i just saw the radar, alot going on down there especially SE florida by you..keep an eye out for any waterspouts or severe stuff ok...stay safe..........meanwhile roasting up here and not a drop in sight whew. its possible..the first week of July could get interesting,just model hints right now. Billsfan..are any of these bothering Your neighborhood?......iguana's i hear are really bothering folks down there being rather destructive. Afternoon rain is just missing me! Darn, but it's cloudy. Yes Largo, my neighborhood has a terrible iguana problem. They're nasty, destructive and dirty things. Damn the idiots who smuggled them in from wherever. We don't have plants that they would like, nor a pool, so we don't have many. It's legal to humanely kill them. BillsfaninSoFla wrote: Afternoon rain is just missing me! Darn, but it's cloudy. ok i saw a big news article on them..yeah nasty critters. * HEAT INDEX VALUES...Around 108 degrees this afternoon. Good Sunday morning folks! 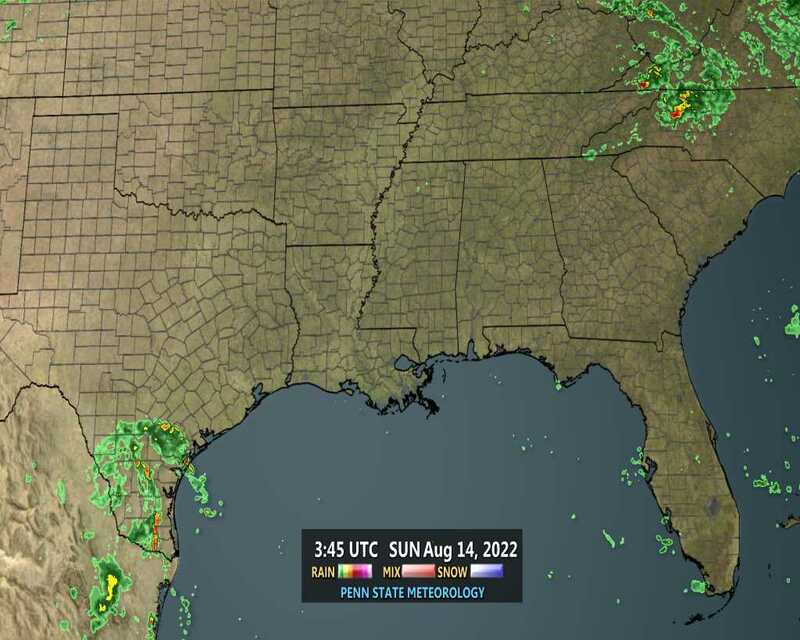 !,,,NWS is saying much better rain chances today especially gulf coast areas finally...could get heavy later this afternoon........well this being our last Sunday in June..im making a great pot of COFFEE etc for ya'all..enjoy...have a great day everyone!! the afternoon and early evening hours are expected each day. 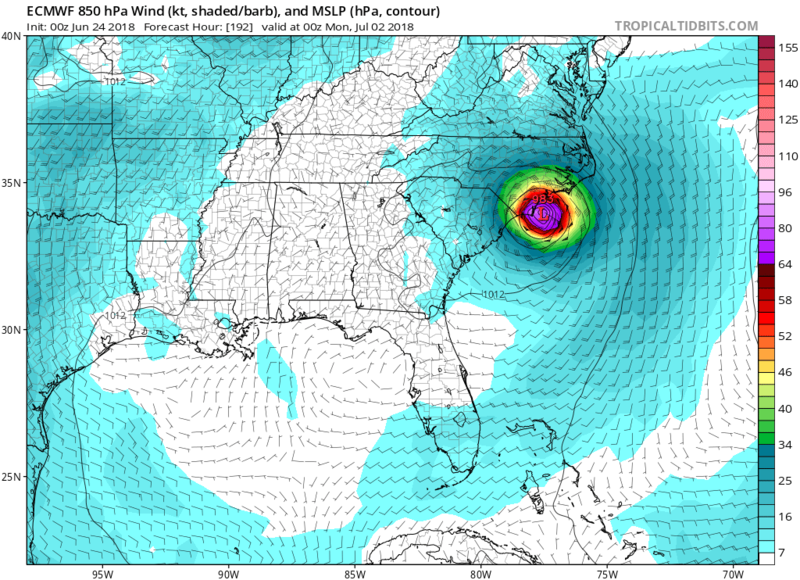 The Euro is spinning up some tropical mischief off the SE coast later this week before bringing it ashore the southern NC coast as a potential cat1 hurricane. 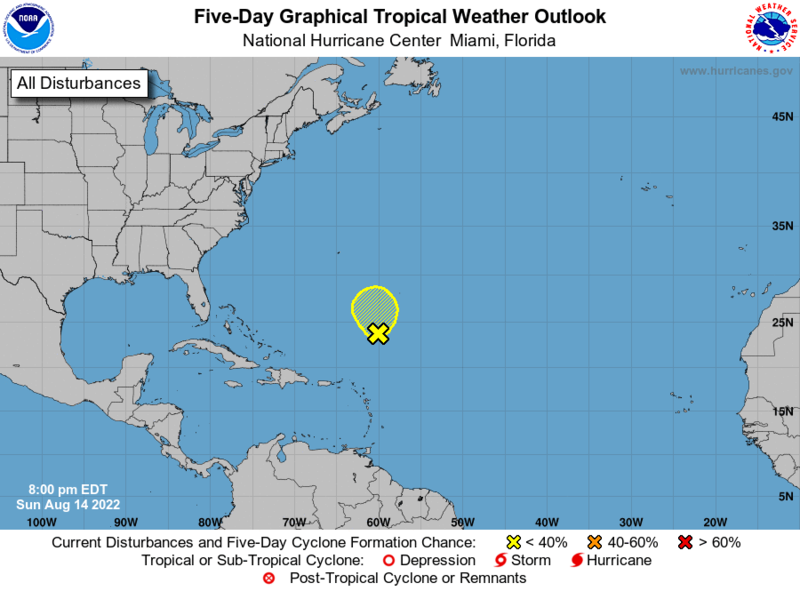 Largo posted the Canadian model from yesterday with the same general idea. We shall see. There is some serious SAL out there.... homegrown will be about all we see in the near future....and I'm not complaining (as long as the eastern GOM stays quiet). I will say that I would welcome a repeat of Debby at this point though, I need some rain! sangria wrote: There is some serious SAL out there.... homegrown will be about all we see in the near future....and I'm not complaining (as long as the eastern GOM stays quiet). I will say that I would welcome a repeat of Debby at this point though, I need some rain! local TV met is saying WE have very good chances for rain later this afternoon/evening,especially west of I-75 and the storms may stall over us..i sure hope this pans out..i can use a couple inches over my house, when its HOT and DRY. 00z to 02z with VFR conditions and light winds thereafter. No substantial changes were made to the existing forecast. it just may be an interesting late afternoon-evening later today huh...good luck gulf coasters who Need the rain!! Intersection Krome And U.S. 27. Movement was northwest at 5 mph. will be possible with these storms. Miami-Dade and southern Broward Counties.